I have to hand it to Microsoft, the company is doing some very exciting and progressive things these days. Beyond their virtual reality ambitions with HoloLens, there is already a trio of software updates that clearly show that there are some fresh and innovative ideas at work. More particularly,along with the new Xbox One user interface, which offered a breath of fresh air to the more competitive than ever Xbox One, this year has seen the launch of Windows 10, the latest OS that actually manages to make me forget the irritations Windows 8 engendered, in favour of a slick, smooth and modern way of accessing one’s computer. Rounding up this trio is the latest edition of Office, which Microsoft recently walked us through in a hands-on session. Following that, I had a little more time to go through what this latest upgrade offers at my own pace, and for the most part, I am very impressed. Much like on Windows 10, it’s no minor upgrade from the previous version either. Office 2016 seems much more customer friendly and aware of the world in which we live, in which users are likely to tote multiple devices, enjoy using multiple, differing operating platforms and where mobility has for many become the new normal. To this end, and something which I particularly like, as an owner of a couple of PCs, Android phone and iPads is that Office 2016 doesn’t make one feel ringfenced to Windows. Rather, it offers a multiplatform versatility which enables one to start a document or email on one’s notebook, pick it up where it may have been left off on a tablet, and then perhaps add some finishing touches on one’s smartphone. This genuinely lives up to the claim of work following me where I go (for better or worse) and being available when I need wherever I happen to be at the time. Yes, this could similarly be done using Google Drive, but pinning word documents or OneNote entries, for example, to OneDrive, feels considerably more integrated. While this is not a full on review of every product in the Office suite, there are some outstanding improvements that make it worth serious consideration across the board. One of the problems with Word in the past is that it was packed to the brim with functionality, that many had no idea how to find never mind use. This has been mitigated against with a new Tell Me feature, in which you can simply type what you want to do and the programme brings the necessary steps to your fingertips. Yes, the ribbon is still present, but it’s a time saver to bypass trying to figure out what category my task at hand might fall under. In a similar vein, another notable new feature is Smart Lookup, from the same Tell Me (what you want to do) box. Here, you can essentially shortcut your browser, get some information on a topic from within Word itself, usually from Wikipedia. For example, typing Charles Darwin into the Tell Me box and clicking Smart Lookup brought up his biography. For those doing school projects within Word, I suspect it could be a boon, for research purposes only, of course. There is also a lot smoother integration between typing a document and then sharing it from within Word itself as well as sharing it to OneDrive to make additional edits on my iPad or other Word-app sporting device. This is considerably easier than, for example, having to first import it into Google Drive, share it, note and track the changes and comments made, and then bring it back into Word if I wanted to send it on to a client as a Word document. Incidentally, third party receivers of this document do not need the latest version in order to view documents, not only can it be accessed by previous versions of the software, it can also be accessed using the readily available online Office suite as well. The essential partner to this smoother workflow is OneNote, a crucial part of most if not all the cloud based features. This repository is similarly accessible, and clearly there is a theme of making the user interface familiar across the board, from one app to the next. It’s an approach that the likes of Adobe have used for a very long time, it works no less well here, especially as you get into a back and forth rhythm between navigating Word, Excel, Outlook and OneNote. This familiarity in its ethos and accessibility seems enhanced in Office 2016, which makes working across the different apps that much smoother. Also worth mentioning is another oft used app, Outlook.If you routinely receive loads and loads of emails, and find that sometimes important emails slip through the cracks, then you may agree that anything that can be done to make email management ‘’better, faster, stronger’ is welcome. Outlook 2016’s answer to this is placing commonly used actions on its own menu running down the right hand side of each email item. Respond, Mark as Read, Delete, Move and then, the one I covet, Follow up, are right alongside each message, as well as navigation arrows to move from one message to the next all from the same panel. It’s genius and easily my best feature here. One other feature that I absolutely must mention is how attaching files within Outlook has been streamlined. Smart Attach enables users to bypass having to search their computer for the file they want to send from within directories. So long as it is already open, Outlook 2016 will automatically detect it, and display it in a list when you try insert a file. 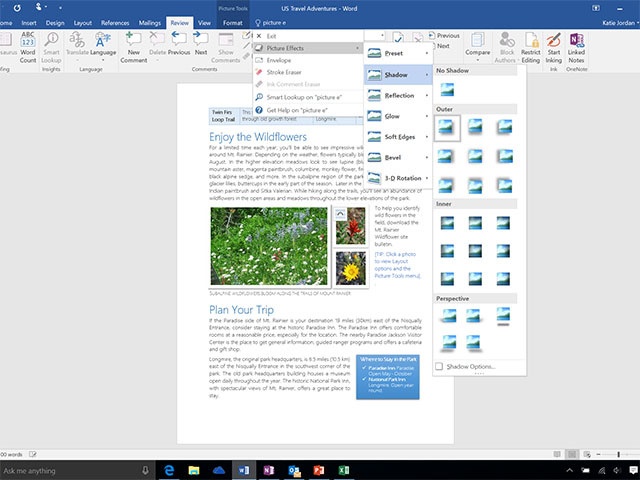 Admittedly, there is much more that can be said about what Office 2016 brings to the table, with more in its lineup, including Excel, PowerPoint, the sadly underappreciated OneNote and a new addition to the team, storytelling app Sway. However, those could easily take up an article of their own. What’s more important for now, perhaps is the pricing. 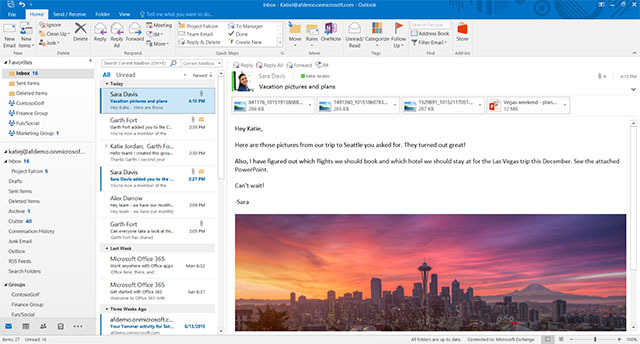 Office 2016 is available in two ways – either as a standalone product, or, and the avenue Microsoft recommended, via an Office 365 subscription. The former, depending on which version you buy, will start at just under the R1500 mark for the Office Home and Student version. However, opting for a subscription appears to be considerably greater value, especially if you have multiple devices you want to install the Office suite across. More specifically, the subscription enables users to install Office 365 across five PCs or Apple Mac’s, five tablets and five mobile phones. Sweetening the deal, it also brings a terabyte of OneDrive storage and 60 free minutes of Skype per month. For those concerned about the abysmal dollar-rand exchange rate (who isn’t) and has trepidation about how this may affect the price of the subscription moving forward, it is possible to stack up to five yearly subscriptions and activate them as each year passes. Of course it is also available on a monthly basis for R95 a month. Office 365 Home will cost R950 per year or R95 a month, while Office 465 Personal will set you back R750 a year or R75 a month. The difference between the two is the number of devices it can be installed one, with the former enabling you to install it on five PCs, tablets and smartphones but only one of each on the latter. Standalone, one time purchases of Office Home and Student 2016, Office Home and Business 2016 and Office Professional 2016 will see you forking out to the tune of R1 350, R3 000 and R4 900 respectively. Would I recommend it even if you have older versions? Yes, because this one brings a great deal to the table to making working and productivity faster, easier and dare I say, more enjoyable.